Fake blood is an essential accessory if you’re going for a gory halloween look with your costume this year. 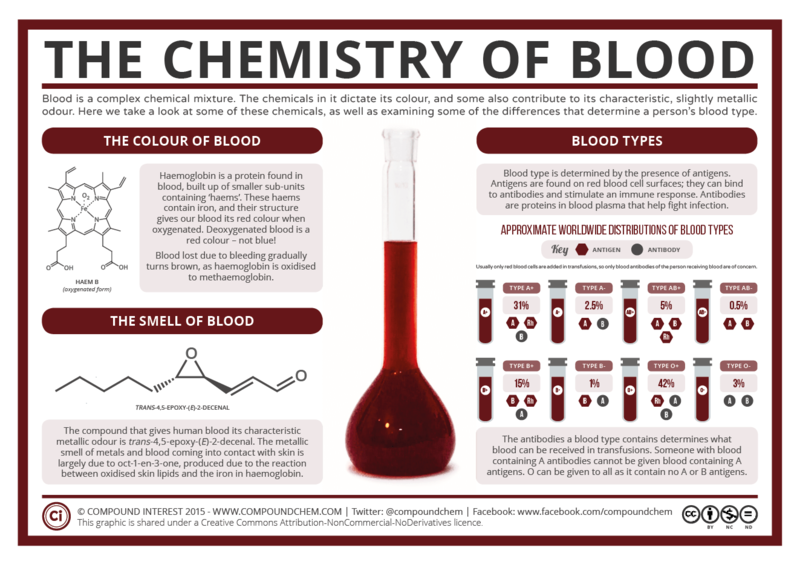 There’s a lot of chemistry in the substance it sets out to mimic; we can explain the colour, smell, and different types of blood with the aid of chemistry (and some biology thrown in for good measure).Today’s graphic takes a look at each in turn. 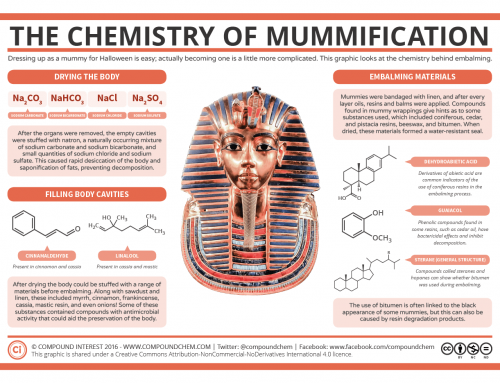 The chemistry behind blood’s colour is perhaps that we’re all most familiar with. Most of us are aware that blood contains haemoglobin; this is the protein, found within red blood cells, that enables our blood to carry oxygen to our cells. It also helps carry some carbon dioxide back to the lungs, in the form of carbaminohaemoglobin, though the majority of carbon dioxide is carried in the blood as bicarbonate ions. The red colouration of blood is due to the sub-units of the haemoglobin protein. Each of the four sub-unit consists of a protein chain which is bound to a haem group. It is these haem groups, which contain bound iron atoms, that cause blood’s dark red colour. Their structure of alternating double and single bonds absorbs light of particular wavelengths, causing us to see it as red. Red isn’t actually the only possible blood colour; some animals can have green, blue, or even purple blood, due the the use of different oxygen-carrying proteins. A common misconception about our blood is that deoxygenated blood (that which flows back from our cells through out veins) is blue. Veins do appear blue when we look at them through our skin, so it’s perfectly understandable that a lot of people think that this is the case; also, pick up any biology textbook, and the likelihood is that in a diagram depicting blood vessels the veins will be denoted with a blue colouration. Whereas oxygenated haemoglobin is a bright red, deoxygenated haemoglobin is a darker red colour – but not blue! The reason that blood appears blue when we look at our veins through our skin is due to the interaction of light with both our blood and the skin covering the blood vessels. Red light can penetrate more deeply into our tissues than blue light, and since deoxygenated blood absorbs more red light than oxygenated blood, our veins tend to look blue as a result. Haemoglobin can also help us explain the colour change we see in blood when it’s removed from the body. If you’ve ever had a nose bleed, you’ll have probably noticed that any blood you stem with a tissue turns a dark brown colour as it dries. This is due to the oxidation of the iron atoms in the haemoglobin subunits, from iron (II) to iron (III), producing methaemoglobin which is a dark brown colour. If you’ve ever, say, accidentally bitten your tongue, you’ll have also noticed that blood has a somewhat metallic taste. This is in part due to the presence of the iron in haemoglobin; it can also react with fat molecules to produce a range of compounds that help to produce a metallic flavour. The compounds created include oct-1-en-3-one, which is described as having a mushroom-like, metallic odour. This is also the compound behind the metallic smell you can detect on your skin after touching metal objects – so in these cases it’s not the metal you’re smelling, but chemical breakdown products of molecules in your own skin. Blood itself smells metallic all on its own. Researchers have determined that a particular compound in blood that contributes this faint metallic odour, trans-4,5-epoxy-(E)-2-decenal, is also an important compound detected by predators. A study last year identified the compound, then ran a number of tests with different predators where they soaked logs in the compound, as well as soaking other logs in actual blood, fruit-essence, and an almost odourless compound. They found that the predators were attracted to the log soaked in trans-4,5-epoxy-(E)-2-decenal as much as that soaked in actual blood. Though all of our blood is coloured by haemoglobin, and blood from different people will produce the same metallic smell, there are still differences in blood from one person to the next. We commonly refer to these differences as blood types. There are actually lots of different blood types (35 are recognised by the International Society of Blood Transfusion) but there are essentially two classifications that we usually refer to. The first of these classifications is the ABO system. A person can have type A, type B, type AB or type O blood. This classification is determined by the presence of antigens, which are structures found on the surface of red blood cells. They are either sugars or proteins, and the types of antigens present in a person’s blood determines their blood type. Type A blood has A antigens on the red blood cells; type B blood has B antigens. Type AB blood has both A and B antigens, whereas type O blood has neither. Our own blood antigens are ignored by our own immune system; however, if, during a transfusion, we receive blood containing an antigen not found in our own blood, it can trigger an adverse immune reaction. Our blood also contains antibodies; these are proteins in blood plasma that help to fight infection. In most transfusions, it is only the red blood cells that are transferred from the donor’s blood to the recipient. If these red blood cells have antigens that match to an antibody in the recipient’s blood, the antigens bind to the antibodies, and the adverse reaction is set into motion. This is why people with some blood types can only receive blood from certain other blood types. O group blood is known as the universal donor, because, since its red blood cells don’t contain A or B antigens, it can be safely given to recipients with any blood type. Similarly, group AB blood is known as the universal acceptor, because it doesn’t contain A or B antibodies, so no reaction will be triggered even if blood with A or B antigens is given. Blood type can also be termed as positive (e.g. A+) or negative (A-). This refers to the presence or absence of Rh antigens on the red blood cells, and is also something that must be considered during blood transfusions. Rh positive blood cannot be given to Rh negative recipients, as the recipient can develop Rh antibodies which can then attack the donated blood. People with Rh positive blood can receive blood from either Rh positive or Rh negative donors. This is all a little bit confusing to get your head around, so here’s a handy diagram which shows which blood types can be given to patients with a particular blood type. 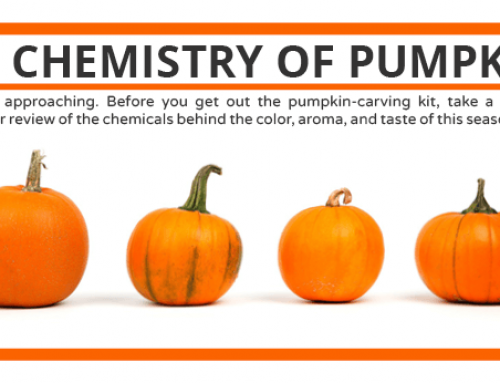 To conclude (and point out the obvious), of course the fake blood we’ll all be using for Halloween chemically doesn’t have a whole lot in common with actual blood. The red colouration usually comes from red food colouring, and some gloopiness is added via the addition of some form of sugar syrup. There are also numerous suggested recipes for making your own online which use cornflour to thicken it up and give it a more congealed look.